Goulston Street Graffito: Jack the Ripper Clue or Not? The Juews are the men that will not be blamed for nothing. The Goulston Street Graffito: Possibly the most intriguing piece of evidence in the Jack the Ripper Case. This enigmatic sentence appeared the night of the Double Event, and has spurred numerous theories from Masonic conspiracy theory to anti-semitic scapegoating to counter-forensic measures. The core question that remains: did the Ripper himself leave this clue? In the wee hours of September 30, Louis Diemschutz discovered a woman’s body on Berner Street outside the International Working Men’s Educational Club. The woman, later identified as Elizabeth Stride, bled to death from a deep cut in her throat only moments before. The state of the body indicated that the murderer had been interrupted in the progress of his crime, probably by Diemschutz’s approaching pony cart. Less than an hour later, the killer ran into Catherine Eddowes and completed his grisly work. 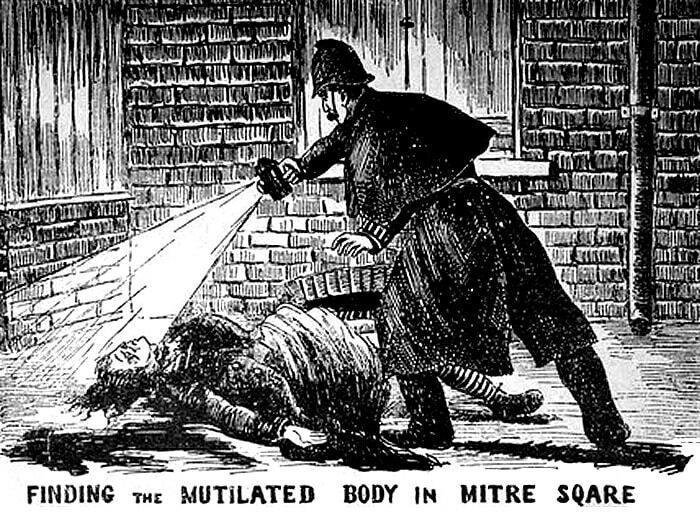 Eddowes’ body was horribly mutilated–exhibiting massive knife wounds with the internal organs strewn around her body. Even while Metropolitan police investigated the crime scene on Berner street, constables from the City Police were called to the horrifying display in Mitre Square. Detective Constables Daniel Halse and Edward Marriott led canvassing of the area for clues and suspects. Right before 3 am, PC Alfred Long found a blood-soaked piece of a woman’s apron lying on Goulston Street outside the Wentworth Dwellings. A few feet away on the dirty brick was written: “The Juews are the men that will not be blamed for nothing.” Long searched the sidewalk and nearby staircases, but found no suspects and no other traces of blood. It was as if the apron had been placed strategically for him to find. That would suggest the graffito was strategic as well. He left another constable to guard the writing and brought the apron piece to the Duty Constable at the Commercial Street police station. More city police arrived on the scene to investigate the Wentworth Dwellings and speak to the building’s occupants. Inspector McWilliam directed that the graffito be photographed, but no photos would be taken. Sir Charles Warren soon arrived on the scene and made what would become one of the case’s most contentious decisions. At the time, Whitechapel was home to a growing number of Jewish immigrants from all over Europe. They were viewed with suspicion because of their often socialist political views, as well as from plain old racial prejudice. A notorious murder case had recently taken place in the neighborhood perpetrated by a Jewish man named Israel Lipski, and his name had turned into a slur against Jewish people. Additionally, John Pizer, another Jewish man and an early Ripper suspect, was almost killed by an angry mob. At the Superintendent’s suggestion, Sir Charles Warren ordered the graffito washed away before the sun rose on the 30th. Though the Whitechapel police claimed it was to subvert a riot, many continue to believe that someone on the police force was involved in a coverup. Written by the Ripper…or not? There are two camps regarding the Goulston Street Graffito: one that considers it a relevant clue and one that doesn’t. Those that do believe it is a relevant clue connect it to multiple theories. This reasoning fits in with the narrative of a conniving, scheming killer who purposefully taunted police. The most famous interpretation, originated by Stephen Knight, is that the graffito was a puzzle-piece in the royal conspiracy. “Juwes” was a not a misspelling of “Jews” but rather a reference to Masonic canon. Another is that the Ripper was not Jewish, but wrote an anti-semitic message to throw police off his trail. It isn’t too much of a stretch to think his hatred wasn’t just directed toward women, but toward the neighborhood immigrants as well. 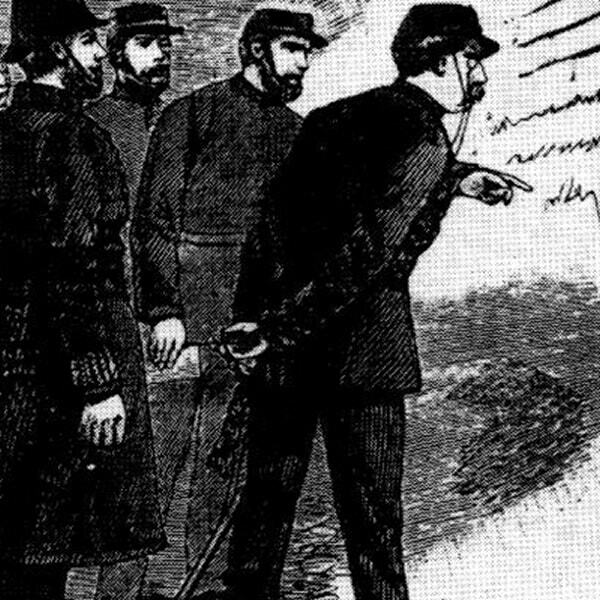 The “anti” group believe the graffito is unrelated to the murder–that the Ripper’s leaving evidence was a coincidence. They say that it was dropped by mistake and whatever was scratched on the wall nearby would have sparked the same questions. 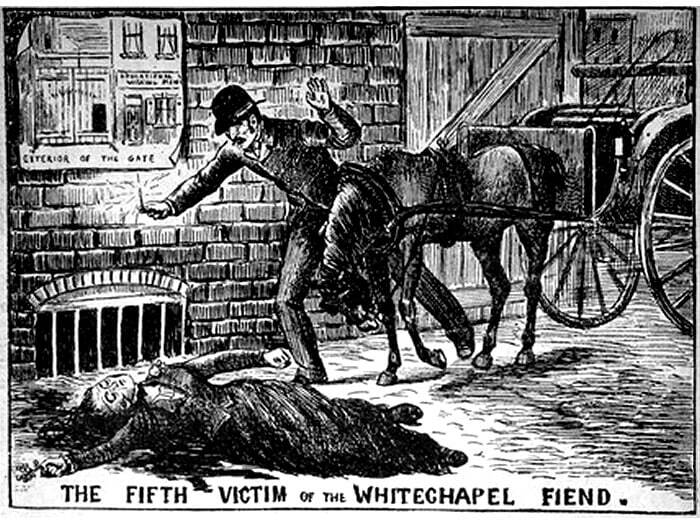 Here, the Ripper is illiterate and chaotic, and was only elusive because of Whitechapel’s darkness and his ability to cut victims’ throats before they had a chance to scream. As with most aspects of the Ripper case, we will likely never know either way. The writing will continue existing as a quandary and a point of debate. In this case, the writing on the wall illuminates very little.